The Spanish Network for Mathematics & Industry (math-in) & Repsol are pleased to announce the first edition of the math-in awards & math-in | Repsol award to distinguish outstanding PhD and MSc theses in Industrial Mathematics to be awarded at the 1st Conference on Transfer Between Mathematics and Industry (CTMI 2019) in Santiago de Compostela, Spain, July 22-24, 2019. These awards, one for PhD thesis and two for MSc theses, will recognize the contributions of the candidates attending to the novelty of the project, the technology generated in their work, the development and use of new mathematical tools, as well as the benefits obtained by the company. This award for one PhD thesis will recognize the contributions of the candidates attending to the novelty of the project, the technology generated in their work, the development and use of new mathematical tools, as well as the benefits obtained by the company. The PhD theses in the field of energy sector will have priority. Every person who has presented a PhD or MSc thesis in Industrial Mathematics and got it approved at a University or a Research Organization in the European Union in 2017 or 2018 qualifies for the awards and can apply. Certificate PhD or MSc thesis. A statement summarizing the candidate’s contribution to the transfer between Mathematics and Industry, justifying the nomination (two pages maximum). In this statement, the candidate should make clear the novelty of the project, the technology which has been generated, the new mathematical tools that have been developed and used, and the benefits for the company. Letter of the company guaranteeing the benefits obtained from the PhD or MSc work. Letter from the Director PhD or MSc thesis (approving the application). An Open Call has been launched for candidates that are wishing to submit their applications. Each award includes an Award Certificate, a monetary prize to be determined its amount, and the cost of the conference registration for each PhD thesis and MSc thesis awarded. The award includes an Award Certificate, a monetary prize of 1,500 €, and the cost of the conference registration for the PhD thesis Award. It also includes an invitation to perform a stay/secondment at Repsol Technology Lab, in Móstoles (Madrid) for three months giving the opportunity for being integrated into one of Technology Lab projects during that time. For the stay/ secondment time there will be no additional allowances. The math-in 2019 Awards will be awarded to the best one PhD thesis and the best two MSc theses, according to a Committee nominated by math-in. The math-in | Repsol Award 2019 will be awarded to the best one PhD thesis, according to a Committee nominated by math-in & Repsol. 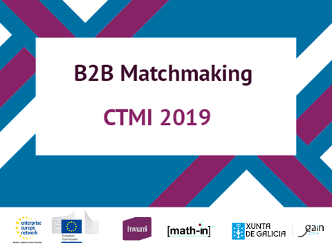 The Math-in Awards & Math-in | Repsol Award will be handed over during the CTMI 2019 Conference. The best two PhD theses and the best two MSc theses will be presented at the "Minisymposium IV: PhD & MSc Awards in Industrial Mathematics" in the framework of CTMI 2019.